Getting your hands on a small-to-medium SUV to tow a smaller van isn’t as easy as it sounds. Several vehicles have a decent maximum tow rating of around 2000kg, but most fall down on towball mass maximums – it’s rare to see one with 10 per cent of max towing capacity. 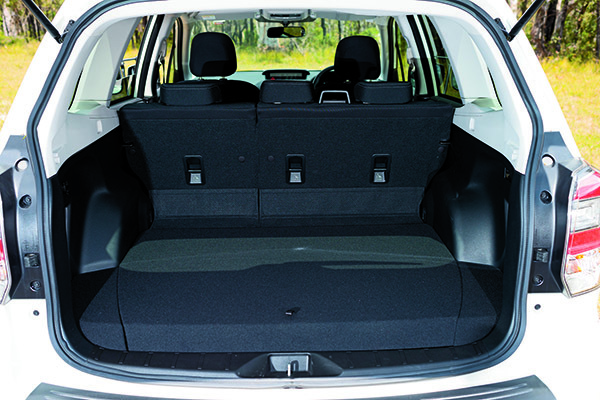 Even the Hyundai Santa Fe, with its 2500kg towing capability – as long as it has a manual gearbox – has a TBM of just 150kg maximum – and even that’s only provided you tick the extra-cost Load Assist Kit option at purchasing time, otherwise it’s only 100kg. The Subaru Forester is one of the few vehicles that does give you the full 10 per cent – its 1800kg maximum braked towing capacity is complemented by a maximum 180kg TBM. The Forester range was refreshed in February 2016, with suspension improvements for better stability, reductions in noise, vibration and harshness (NVH) and some other minor changes. Outside, 2016 updates include a new front bumper, grille, headlights and taillights and new 17in alloy wheels. Inside, a new textured material covers door pulls and the central pillars of the instrument panel, there’s a new colour LCD multi-information display instrument panel and other minor trim changes. The key features of the diesel-powered 2.0D-L include dual-zone climate control, 17in alloy wheels, X-Mode offroad setting, a rear camera and one-touch folding rear seats. 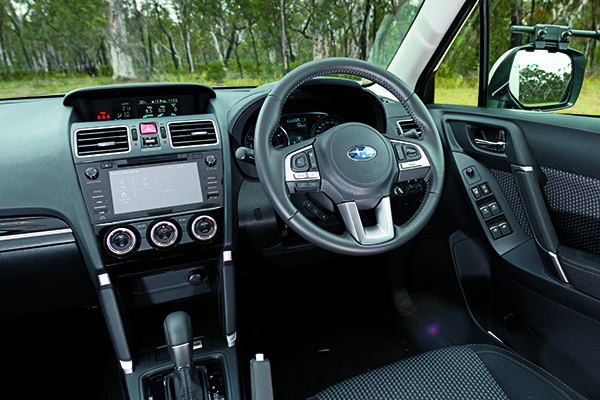 Getting comfortable behind the wheel is pretty easy in the Forester, with its two-plane seat and steering wheel adjustments. The front seats offer support in all the right places and vision out of the Subaru is very good. Key instruments and controls are straight-forward and easy to use, but the MY16’s dashboard revisions don’t work as well. The division of information between the instrument cluster LCD screen, upper dashboard readout and centre screen is a bit clunky – for example, to reset the centre dash fuel consumption digital readout you need to reset the trip meter on the instrument cluster. It works, but it could be better. 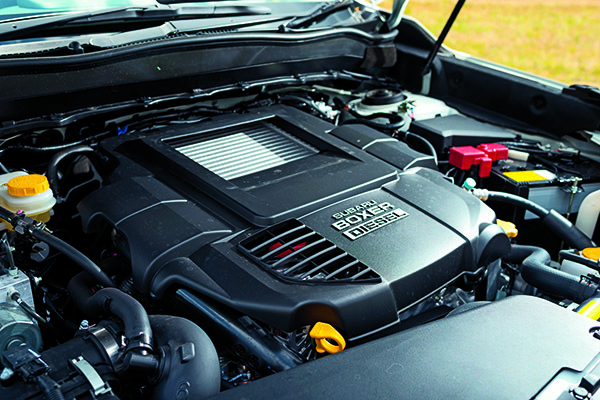 The horizontally-opposed four-cylinder ‘Boxer’ turbodiesel engine is very rattly when cold but is unobtrusive once warm. You still can hear a distant diesel clatter at low speeds but, at cruising speeds, it’s quiet enough. One of the bugbears of some turbocharged engines is turbo lag – a delayed throttle response at low revs as the turbo spins up to its very high operating speed – but it’s all almost non-existent in the Subaru. The transition from low rev/no boost to the meat of the boosted mid-range is not the big jump it is in some turbodiesels. It’s more subtle than that, so you can feel a push in the back as the torque builds up but it’s not so sharp that you’re lunging towards the car in front. The engine has a relatively low compression ratio for a diesel of 15.2:1 and perhaps that explains its willingness to rev to its 4100rpm upshift point when you’re in a hurry. It’s smooth and refined while doing so, too. The CVT has a stepped ‘set’ of gears, meaning that revs rise and fall in a similar fashion to a conventional auto, rather than the typical CVT habit of making the engine reach for high revs under heavy acceleration and holding it there. In this application it works well, seeming to keep the engine in the right rev range for each situation. lack of steering feel in SUVs in not unusual, and the Subaru falls into the middle of the pack here. It’s not especially responsive on turn-in either, but again, it’s on a par with the class. With a mix of mostly urban driving with a small amount of freeway cruising, the Subaru averaged 8.2L/100km on test. When towing, fuel consumption rose to 12.8L/100km. 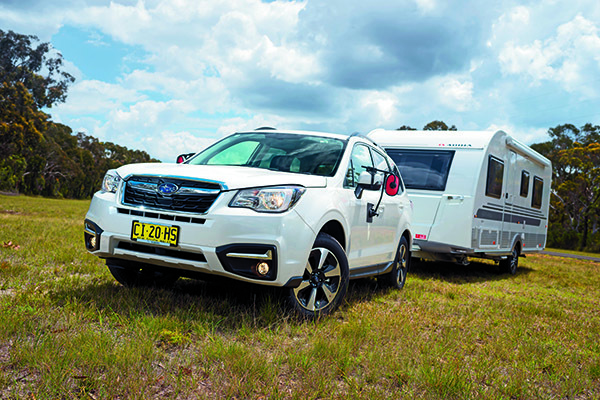 While the Forester has a good towball mass download maximum in relation to its peak towing capacity, Subaru’s restriction of 80km/h for all Subarus when towing is limiting, to say the least. The Forester towed the 1400kg caravan with 125kg towball download well. The combination didn’t give a hint of sway, although the springs felt soft with some fore-aft pitching. The ‘Boxer’ four-cylinder engine took on the extra weight very well and climbing our test hill the Subaru held 80km/h with a small reserve of power to spare. Heading downhill, engine braking was acceptable rather than astounding. The steering wheel-mounted paddleshifters might’ve started out in Formula One and since been adapted by the car industry as a sports-shifting feature, but the Subaru’s work well in this simple towing situation, too. The Forester is a well-built quality SUV with a healthy mix of low fuel consumption, strong performance and a fair degree of comfort. It tows pretty well too, but Subaru needs to revisit its 80km/h towing speed restriction to make it a good all-rounder. Thanks to Apollo Caravan and RV Sales, Lot 2, 31 Bay Rd, Taren Point NSW, (02) 9531 7505, for the loan of the caravan for this test.